1. I have been breaking in my new running shoes these last two weeks. I've only been getting in short weekday runs, between 3-5 miles, about 3 times a week. In a perfect world, the one where I wasn't so lazy, I'd get in another weekday and a longer run on Saturdays. Oh well. I went back to Mizuno Wave Creation, which I have been happy with in the past. Plus I really like the heel design and the zippy orange color. What can I say, I'm a girl. 2. Scott and I have been teaching the 4-5 year old Bible class on Wednesday nights for a year or so. It's been a lot of fun to watch their growth, both physically and in their Biblical knowledge. Every three years our minister, his wife and a few other dedicated helpers, teach a special class for the 4th, 5th and 6th grade boys and girls. It's called Force 410 and they learn, in a fairly challenging way, more about Christianity and worship. The boys and girls are encouraged to study and complete different levels of tests, do service projects, the boys practice helping during worship services, and the boys and girls teach a bible class. This Wednesday night two of the Force 410 girls, Mikayla and Kelsey (both in 5th grade) taught our class, which is also Annelise's class. She adores these big girls to pieces, so needless to say she was beside herself with glee. They did an absolutely fantastic job teaching about Jesus being our foundation. They had visuals, a hands-on application and a even a snack of super cool candy Lego pieces. The boys and girls might not want Scott and I to come back next week since we are not so cool. 3. I have been room mom for Annelise's class this year, except I'm more of a reluctant remedial room mom. I say reluctant because for the first couple weeks of school the sign-up sheet sat pitifully empty, I started to feel guilty, so I decided to give it a whirl. I say remedial because I am a very low key, basic type of room mom. I am a fan of the less is more, not a lot of bells and whistles approach to class parties/activities. This is a room of Pre-K 4-5 year olds, a little bit of excitement goes a long way. Actually other than organizing the class parties and getting an art project together for an auction it hasn't been that bad of a gig. Since the teacher's birthday falls during Spring Break I tried to organize an early celebration today. I sent a note home asking the kids to make a card for her and maybe bring in flowers or a gift if they could/wanted to, and I think most of them did. Yea! Last summer I picked up several of these popcorn boxes at the TarJay $ Spot knowing they'd come in handy for something someday. They did. I filled the bottom with Hershey's Nuggets (her teacher's favorite candy), tucked in some popcorn and a Blockbuster gift card. Annelise made a card and we were set. I loved that it was simple and came out pretty cute too. 4. 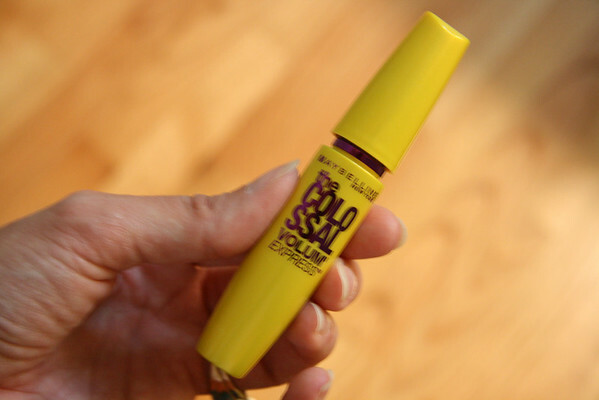 This is a shameless plug for the new mascara I picked up yesterday. Love it. It went on nicely, not clumpy and had good coverage in one swishy-swish across my lashes. I have to admit my gooberness (not that it's ever in question) in not noticing the $1.00 coupon attached to the package until I got home. Bummer. I would probably like it even more. 5. Last week I went to the eye doctor and selected new glasses and sunglasses, in the hopes I will wear my contacts less. I like contacts of course, but my eyes get so dry I end up wanting to claw my contacts off. Not that I would. The new glasses came in today, and while similar to my old pair, they are nevertheless, um...shall I say...bold. I think I like them, but the jury is still out. What do you think? It must be said. Running 3-5 miles, 3 times a week is *not* lazy! :) Love those shoes...I may have to look into those for my next pair. I think the glasses really suit you...they look great! 1. Digging the shoes! ps. you are NOT lazy! 2.What a great job to have at church. the kids are the best to work with. And super idea to have the older kids teach the younger ones! I love your glasses...they are way cute! And as for the running....yeah, I'm lazy too. At least we try. ha! I think it's great that you've been so giving of your time teaching those little ones. And how fabulous to have your own little one blessed by good teaching too. Sounds like you guys have some good stuff going on at your church. I'm always willing to try new mascara. I am never happy with anything because I always end up with smears underneath my eyes. When my Cover Girl runs out, I'll give this one a try. Very cute teacher gift, too!--I saw those popcorn boxes at Target a while back and am kicking myself now that I didn't buy them then! ooooh! i am loving those glasses. i have to get a new pair this year and i'm already trying to figure out frames in my head... :) those are cute- they're bold and sassy- wtihout being overbearing. quite stylish indeed! i also covet your shoes. wow! i love orange. wish i needed a new pair. alas, my gangsta pimped out shoes will be seeing some runs hopefully this fall...(I HOPE!). for now, i live through your running. :) however short or long it may be!! we taught the 4 and 5 year olds in our church classes a couple years ago- they are awesome. they say the most inspired and simple things. i love it. how cool that the older kids came in to teach. sometimes kids are the greatest teachers. and i now KNOW i need to run back and pick up some of those popcorn buckets! i saw them the other day and thought "those have to be useful for something." voila! thanks for the idea. It's all fab on this post, girlfriend. The shoes, the Bible class, the teacher gift, and the new specs. You rock, sista. 1. 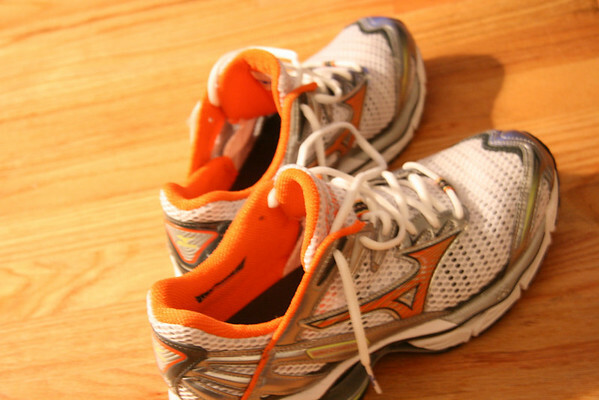 I wear Mizunos too and love them...mine are red but love that orange! 2. What a cute age to teach...and how sweet of those girls. That picture is adorable. 3. More power to you for volunteering! 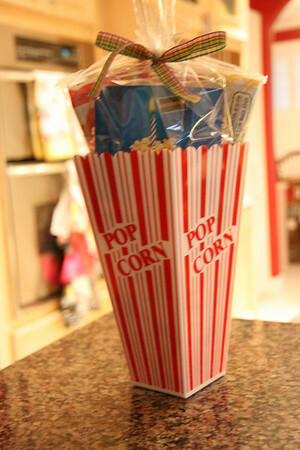 And I saw those adorable popcorn thingys and now wish I had gotten some. 4. I'm a mascara junkie...think I've tried them all but - alas - not THAT one. Will do. 5. Love the specs. You rock, girl! I just saw those popcorn things at target today and thought about buying a few but didn't. Now I have the idea that I will shamelessly steel from you I will run out and buy several :) Thanks for sharing. I love the new glasses. Books at hello??? Now that I am a reader, I would have to say Abram's Daughters by Beverly LEwis. I love the Amish! I am super impressed with M and K's Wed.PM lesson. SO COOL!!! OK - off to be cordial with company. :) Love ya! the glasses look great. 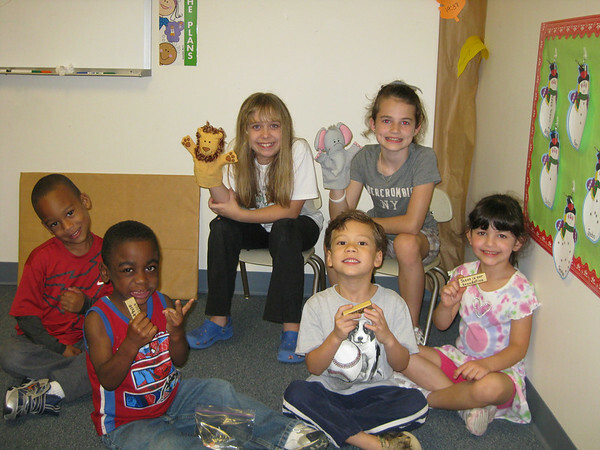 what fun the bible class must have been! Reading your post wore me out! You are so not lazy in MANY aspects! What a great age to be teaching gospel lessons to. And I ♥♥♥ the glasses! I could identify with each and every thing you mentioned except the running! I am busy enough running from myself! LOL. I was a room mother for over 20 years. It's no so bad once you get the hang of it. Mascara? I am a LOREAL carbon black Voluminous girl all the way. Clumps? I am so sure I have them. Too much blush? Probably. What can I say. Your glasses are preciousness on you. I need some new ones so bad. I still have wire rims hidden by the bed. I wear my contacts way too much because I hate my old glasses...this tempts me to go and take the plunge to some hotness like yours. But, can you say trifocals? Oh yeah.....I have those popcorn things too! I love them. And, your ministry with the little ones does not go unnoticed by anyone, believe me. We used to do "Bible Hour" and I know how much work it is. LOVE the glasses. And I will be using that popcorn gift package idea now too. I need some new walking shoes, any advice for me? I like your new running shoes and think it's great you run at all. The Bible class sounds fun. I'm sure you're a great room mom. I don't think the teachers expect anything way over the top, at least they don't seem to here in Utah. I've been room mom for 3 years now and think I'm a minimalist. I love new mascara! I always miss the coupons on the package, did you cut it out and save it for next time? I like your new glasses!